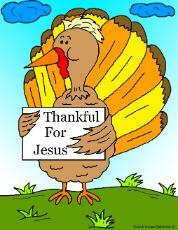 Turkey Holding Sign "Thankful For Jesus"
This is a free printable turkey coloring page for Sunday school, children's church or just for fun at home. Print this coloring page out and let the kids have fun coloring this for Thanksgiving Day. I also added a colored picture if you need that for something. Not sure what you could use it for but it's there in a printable version as well. It is a very large colored page. It prints to a full size of 8.5 x 11.